Call it an apple martini or an appletini, either way, it's a sweet, delicious, and fun cocktail to mix up. Whether you're looking for a sweet and sour, electric green drink or one with a true apple flavor, there's sure to be an apple martini recipe for you. Appletinis are among the most popular fruit martinis in the modern bar. The recipes are quite diverse and the majority feature vodka. While a few use apple brandy or liqueur, others use apple cider or juice. Sour apple martinis use green apple schnapps and are a favorite for many drinkers. 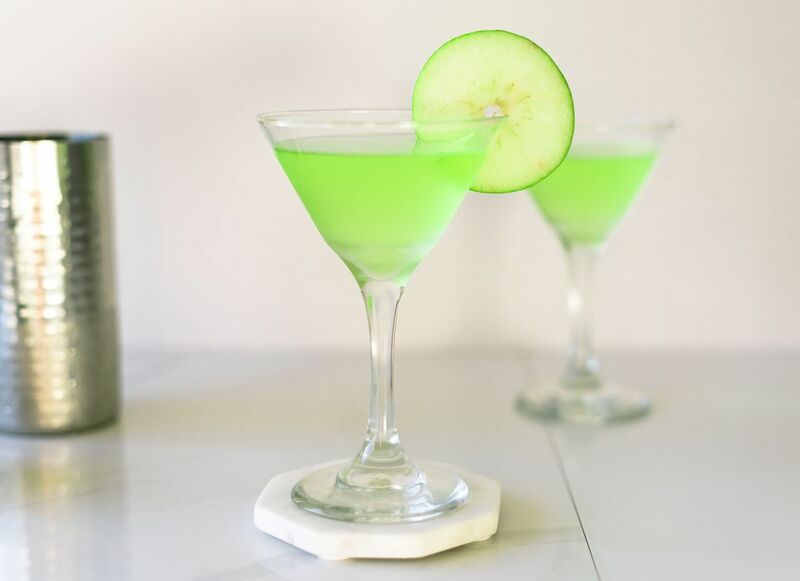 If you're looking for the greenest color for your appletini, this is an ideal recipe. The flavor of this particular schnapps can be quite sweet, so a touch of lemon juice is added for balance. Pour the ingredients into a cocktail shaker filled with ice cubes. Shake well. Strain into a chilled cocktail glass and garnish with an apple slice. You will want to adjust the lemon juice according to the schnapps you're pouring because their sweetness does vary. For instance, with Bols Sour Apple, the lemon in the recipe should be just about perfect. If, however, you opt for the tart bite of DeKuyper's Sour Apple Pucker, it would be best to try it with just a splash of lemon at first. If you choose an apple slice garnish (either green or red), dip it in lemon juice after cutting it. This will preserve its color and keep it from turning yellow once exposed to oxygen. An elegant lemon twist is always a good garnish option as well. A simple variation worth trying is to use a flavored vodka. Citrus and pear are two nice options that will pair nicely with the apple. Also, one of the caramel-flavored vodkas would be an excellent match for any appletini. Dry Apple Martini: Combine 1 1/2 ounces premium vodka and 1/2 ounce each apple liqueur or calvados (apple brandy) and dry vermouth. Shake with ice and strain into a cocktail glass. Garnish it with an apple slice or lemon twist. Semi-Sweet Appletini: Shake and strain 1 1/2 ounces citrus vodka with 3/4 ounce apple liqueur and 1/2 ounce orange liqueur into a chilled cocktail glass. How Strong Is an Apple Martini? It's very rare to find an apple martini that is considered low-proof. On average, you can expect these drinks to weigh in around 25 percent ABV (50 proof). That's pretty potent and the sweetness can actually make your taste buds crave more. Keep this in mind because it's very easy to have one too many of these delicious drinks.